When we install Linux Like operating system at that time Linux kernel install most of device driver’s modules and after the installation it also allows us to install new device drivers as modules using the commands modprobe and insmod. Normally kernel modules are loaded automatically but sometimes you need to install the additional modules as being manual . For instance you want to install device drivers of storage device and etc. For this there are some commands some of them are listed below. lsmod stand for ‘list module‘. As the name suggests this command will list currently loaded kernel modules on your system. If you want to find a specific module. This can be network driver module (e1000) then you can do via grep command. Output of modinfo command clearly show version of this module, description which is showing the manufacture factory, license is GPL and other important information. modprobe command is used to add and remove module from the kernel. Linux maintains kernel module directory under ‘/lib/modules/’uname -r’/kernel/drivers/‘ and configuration files(except for additional configuration file in /etc/modprobe.d/). If we want to look at kernel drivers then run the beneath command. if output of this command is being any error, then you can use ‘–quite‘ option, with this flag or option modprobe will not print error messages. 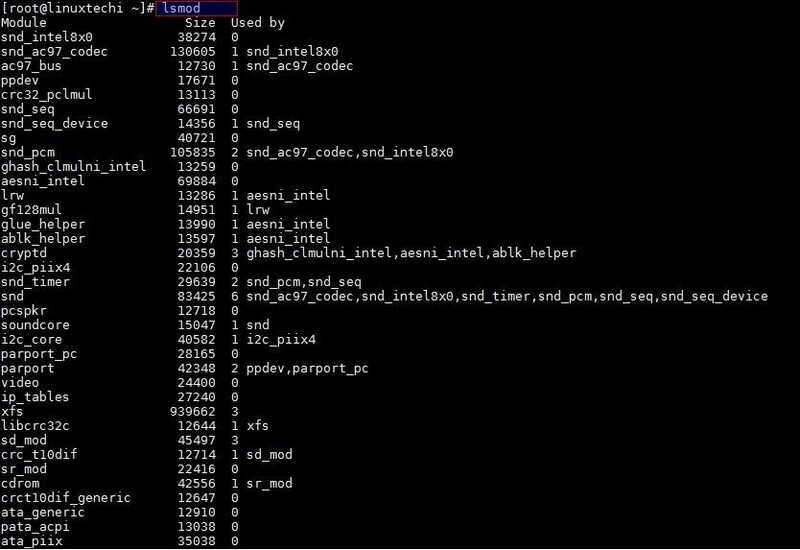 Note : Most of the time we use modprobe command to install kernel module though insmod is also used for loading the kernel module in linux. -r option in modprobe command is used to remove a kernel module. Let’s assume we want to remove the floppy module. At some point of time we may get issues while loading the modules or modules not loaded properly. To overcome these errors we can add or load modules forcefully using ‘–force’ option ( -f) in the modprobe command. If we still face problems or errors while loading the modules, then this time we must do debugging.By enabling debugging we can find exact error or issue before or after installing the modules. In other words debugging is equivalent of dry-run of loading modules. ‘-n’ option in the modprobe command can enable this type of debugging. This option will force modprobe command to perform all module loading steps except the final one. That’s all for this article. I hope you got an idea how to list, install and remove kernel module in Linux.